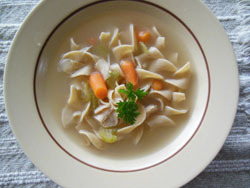 Chicken noodle soup is a wonderful cold weather dish to warm up the kids after playing in the snow. When they say chicken soup for the soul, the meaning can be taken in so many ways. In Stock pot, Saute garlic and onion in oil until onion is translucent, add 1/2 the chicken stock, celery and carrots. Cover cook until carrots are tender. Add remaining stock, water, lemon, chicken and noodles. Cook until noodles are tender. Serve with a snipe of parsley on top.